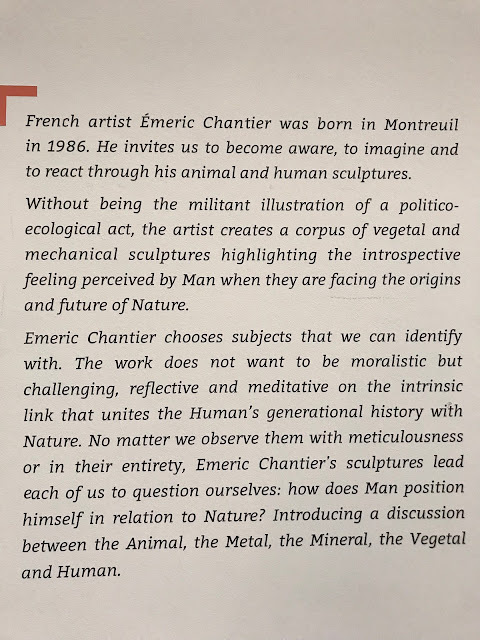 The same day Andrew and I visited the Eiffel Tower, we also toured the anthropology museum; Musée de l'Homme. After walking through the entire museum — and just before closing time — we discovered a wonderful exhibit on mosses, Les Mousses, Sentinelles de la Pollution. 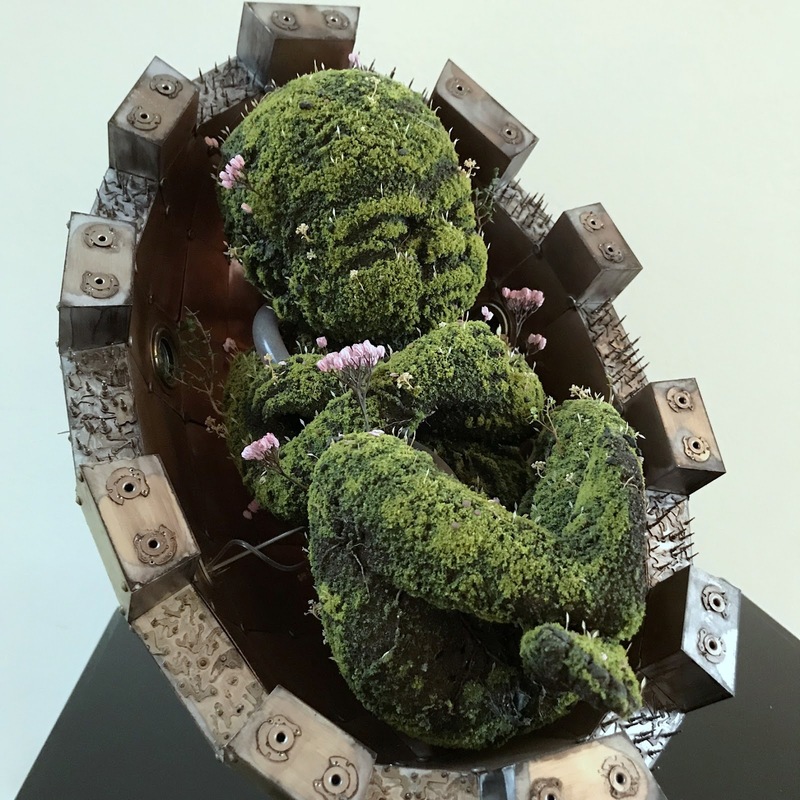 This mixed media piece, Foetus, was one of several by artist Emeric Chantier. And another (because I really liked this one). 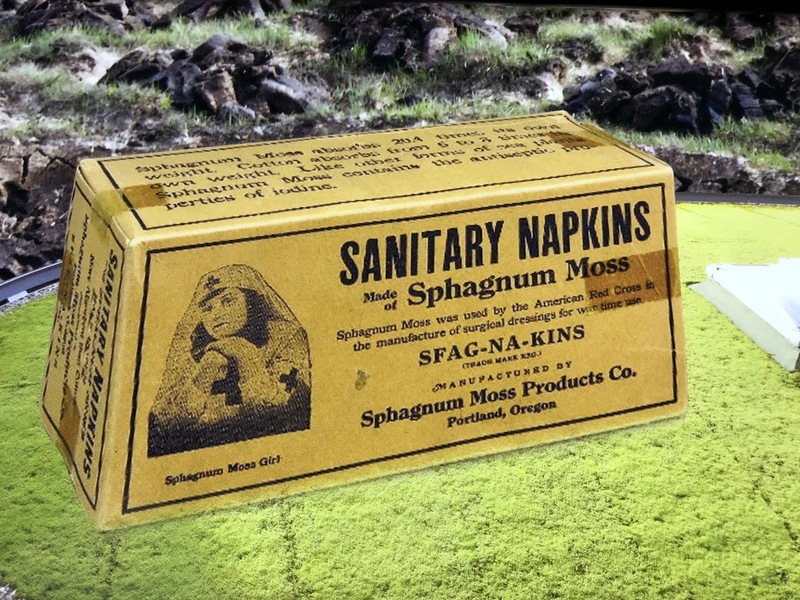 Moss for personal hygiene? Wow. Manufactured in Portland, Oregon! There's a little story with some history of this product on The Museum of Menstruation and Women's Health page, if you're interested. Which I'd seen just the day before. 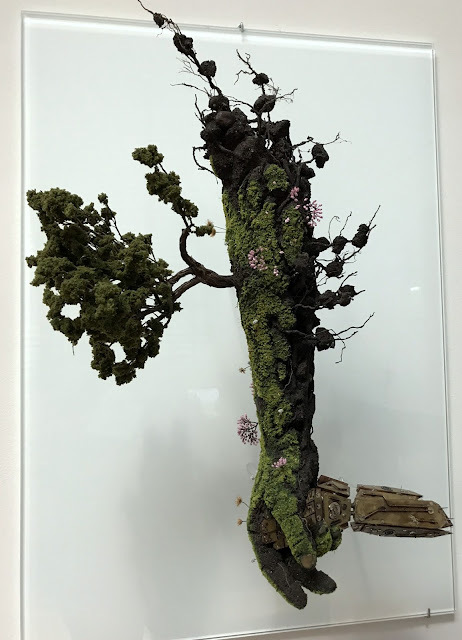 You win for the most unusual info on moss I've ever come across! I very much like the moss hand holding the robot hand. 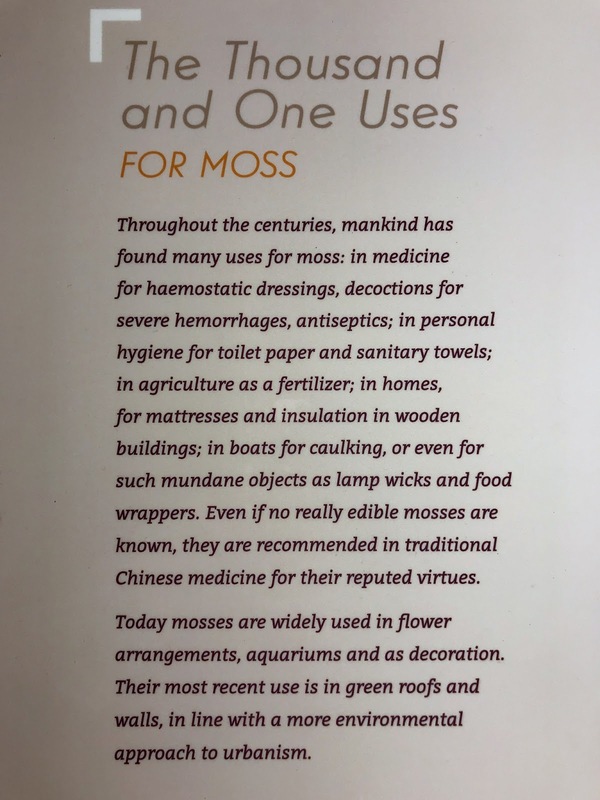 I seem to remember moss's use for personal hygiene figuring in The Clan of the Cave Bear books. 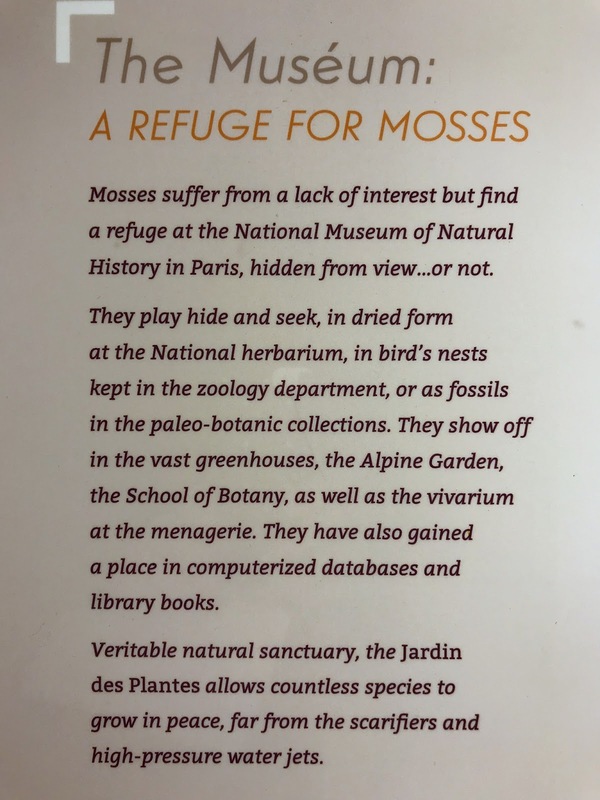 The jardin “where plants are allowed to grow in peace far from the scarifiers...” I love how words can be perceived from a different language. We would not have used the word in this context, for example, but how perfect. 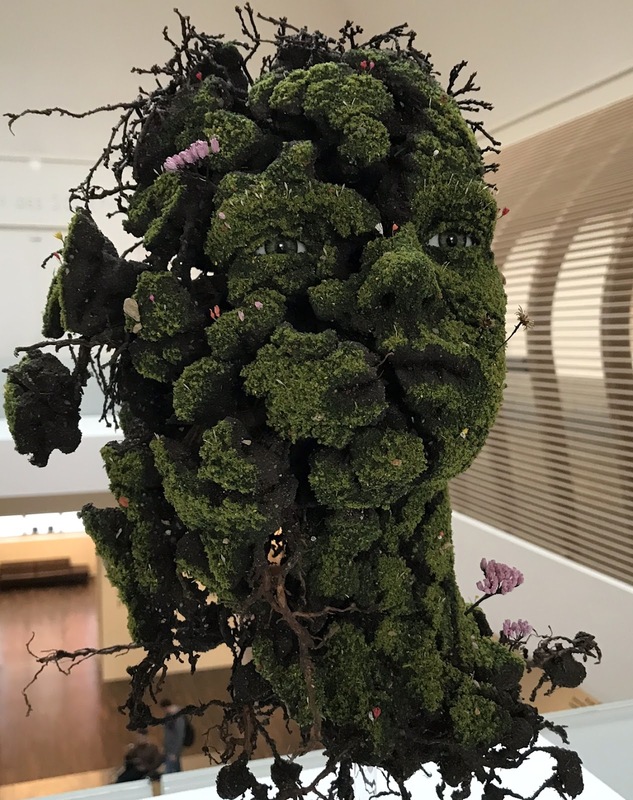 Perhaps a bit of a side track, but this reminds me of Robin Wall Kimmerer, her books Braiding Sweetgrass and Gathering Moss. Thank you for both of those titles, though my book stack is reaching epic heights I am always on the lookout for good ones to add. Glad you enjoyed this post! 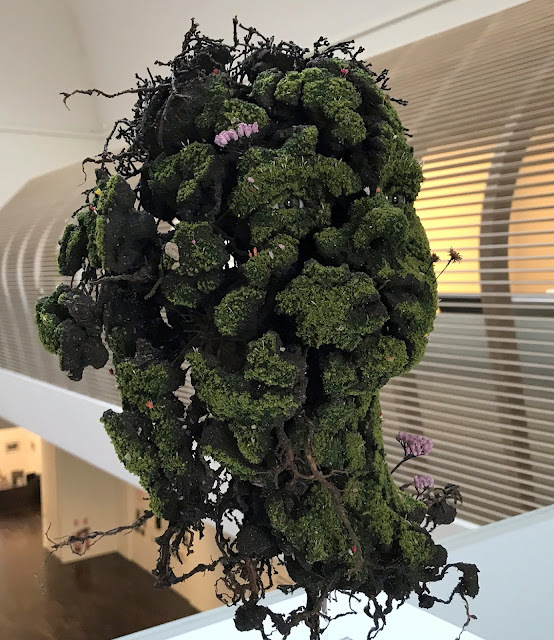 I'm wowed by those moss sculptures. The first one, Foetus, really grabbed me but all were impressive. 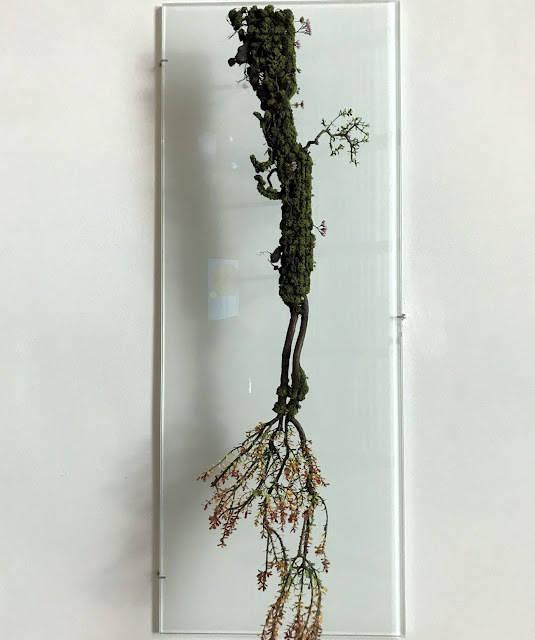 The love of moss expressed by the 2 exhibits brought back memories of the novel, "The Signature of All things" by Elizabeth Gilbert, the protagonist of which focused on the study of moss. Yes! Signature of All Things! Now that's a book I just couldn't get into, I don't know why! Loved the moss sculptures and the thoughts behind them and those they evoked! Thanks for the link which lead to a lot of interesting information. Aren't we lucky to live somewhere with so much natural moss? What a great exhibit to stumble across! 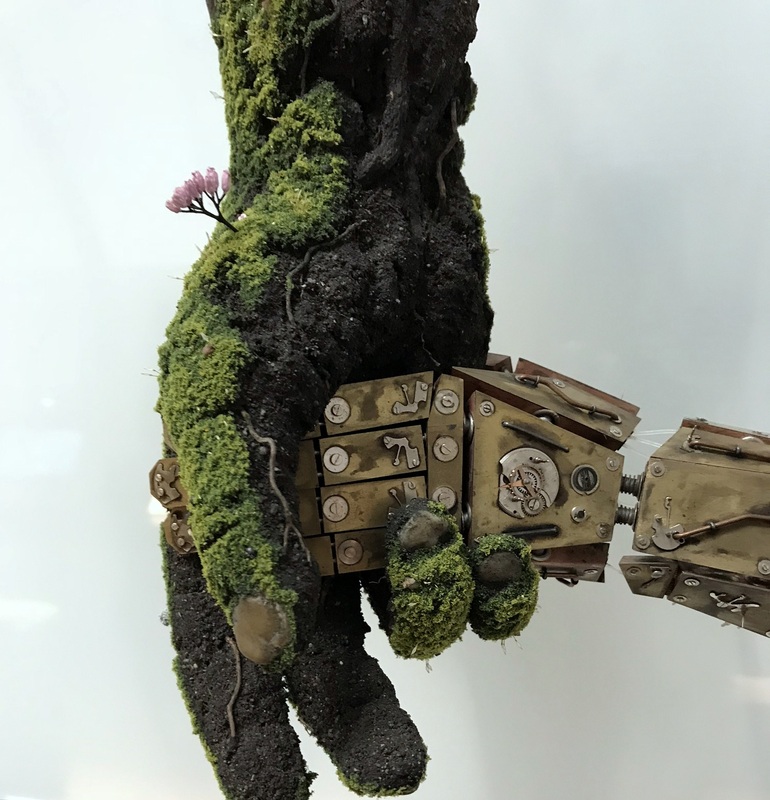 Loved the tree trunk turned into an arm with hand holding artificial hand. Very suggestive of all sorts of transformations. I've used varieties of moss to make a living quilt for an iron-frame bed that sits in one section of our garden. There was a large resort hotel on our property that burned down in 1909. I've used broken china from the hotel and other remnants to re-imagine what the hotel was like. So of course there's a bedroom. Glad you happened by Pat, and your garden installations sound legendary! Mossome! The 'Boy' face is exceptionally well crafted. A moss exhibit ! What a great thing to stumble upon. Right? I just wish I'd had more time. What a chance find! 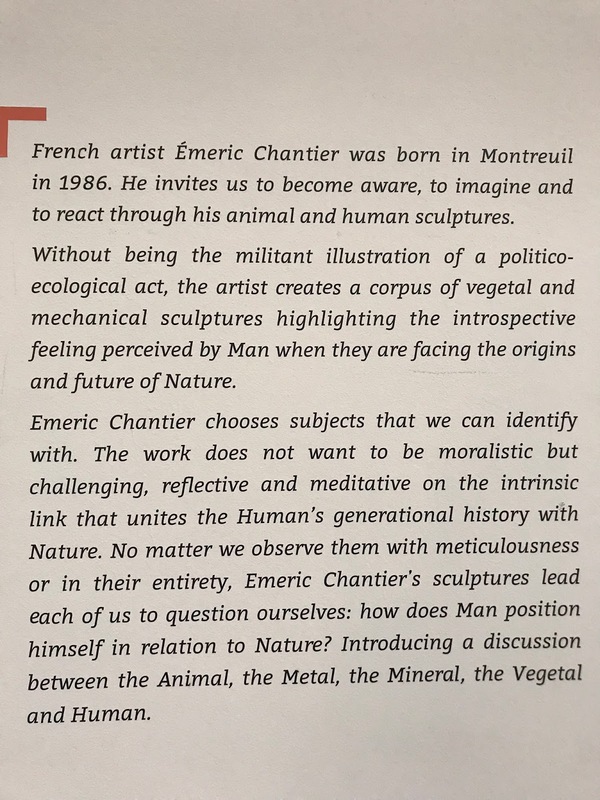 Would love to see this exhibition more closely in the flesh. Also when I saw the preview photo on FB of the hygiene product I was immediately intrigued. Some of the works are both creepy and fascinating at the same time. Too bad you didn't have a chance to visit while you were in Paris, then again there's never enough time to see it all, is there? 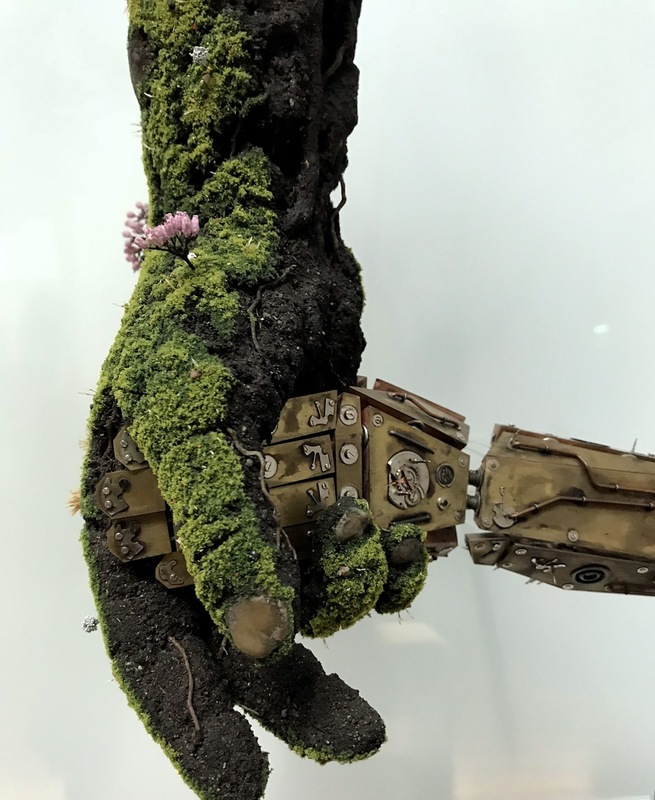 Those sculptures are incredible. I have a feeling if I saw them in person I could get lost for many long minutes studying the intricate details. I seem to remember reading somewhere about the use of mosses in diapers in various tribal cultures, but the list you shared had some uses I hadn't heard of before.